Goldrush, FRANKEL‘s regally bred daughter out of Alexander Goldrun, kicked off the weekend in style, stepping up to stakes company when she powered home to win the Listed Carlingford Stakes on Friday (13th October). John Gosden-trained Monarchs Glen (FRANKEL) also stepped up a level, continuing on an upward curve on Saturday (14th October) when he came from last to first to win the Gr.3 Darley Stakes. Aljezeera has joined FRANKEL’s list of first crop stakes winners after a commanding win in the Listed Beckford Stakes at Yarmouth today (16th October). Bred by Newsells Park Stud, Aljezeera was bought as a yearling at Tattersalls October Book 1 sale for 450,000gns by Al Shaqab Racing. 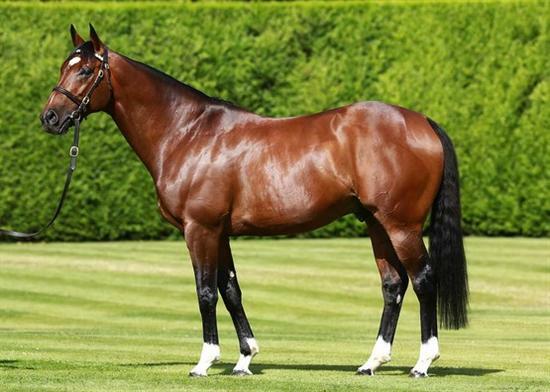 She takes FRANKEL’s first crop statistics to 17 individual stakes winners and 15% stakes winners to foals.